Revolut isn’t technically a bank account, it’s more or less an electronic wallet app. But today’s new feature fills an important gap. Every Revolut user can now access their personal bank account details for GBP transfers. Head over to the Profile tab in the app and you’ll see an account number, sort code and IBAN. This way, you can transfer money from your existing online bank account or receive your salary directly on your Revolut account. It seems like Revolut doesn’t support direct debits yet, but it’s planned. And if you don’t live in the U.K., the startup will also create IBANs in EUR and USD at some point in the future. And it looks like Revolut is getting serious about this bank account idea as savings and credit are already planned. If it gets too complicated, an actual human being from the support team will have to help you. During the beta, Rita could answer 20 percent of the support question. 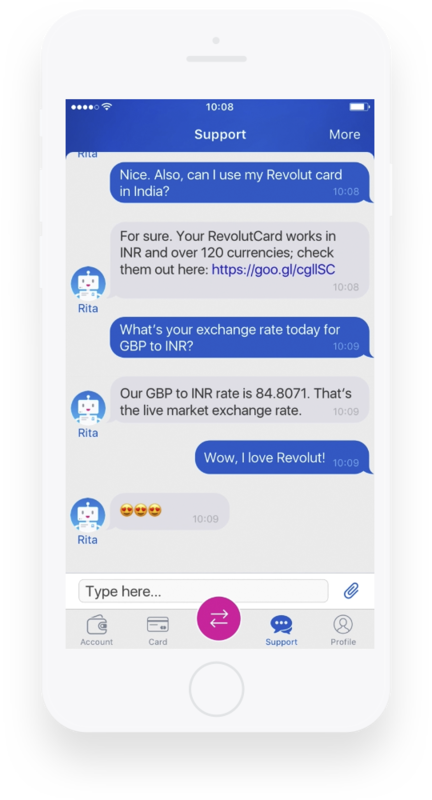 I’m still not sure that chatbots are the best interface for customer support, but Revolut is probably thinking about reducing the support load. For a banking app like Revolut, you need good support, and hiring a big team can get expensive. Maybe the startup can invest more resources into the development team to add new features instead.